When in Batangas, there's a lot of dishes that one must simply not miss from the province. There's the Kapeng Barako, Goto, Lomi Batangas, and - of course - the ever famous Bulalo. 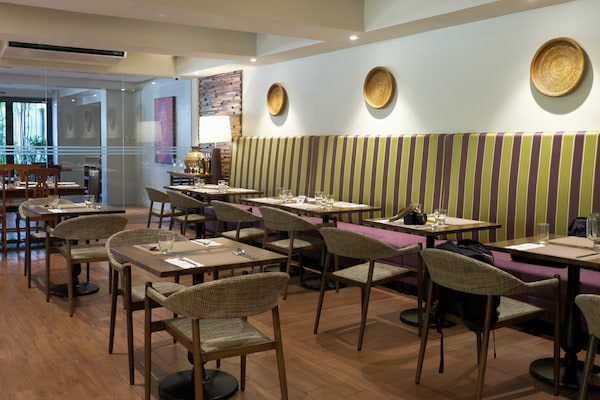 However, if you're not sure what you're craving for, whether it's local, Asian food, or a good mixture of both, there's PLUM Asian Cuisine in Lima Park Hotel which could satisfy your cravings for it. 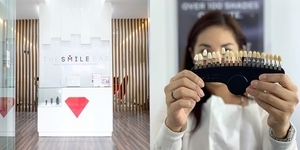 Located right by the borders of Lipa and Malvar, Batangas (hence the name! ), Lima Park Hotel is the only 4-star hotel in Batangas, and offers 136 first-class guestrooms that are perfect for anyone who's on a business trip or is out on a holiday with the family! It also has 3 different dining options - The Patio Bar, La Terraza, and PLUM. 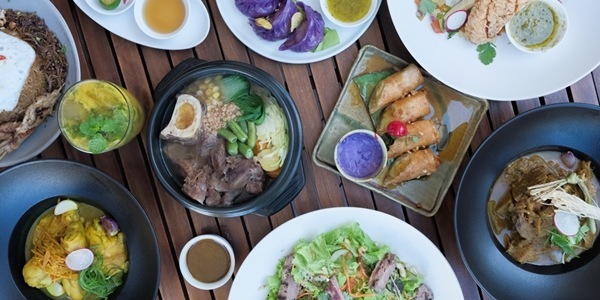 Plum Asian Cuisine is a casual restaurant which serves a menu that represents the different cuisines in Asia, fusing these with each other all while incorporating the flavors that we, Filipinos, also love. 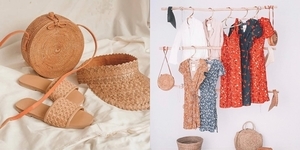 In the morning, it's also the setting for the hotel's breakfast buffet, where guests can enjoy everything from Arroz Caldo and cereals to fresh fruit selections. 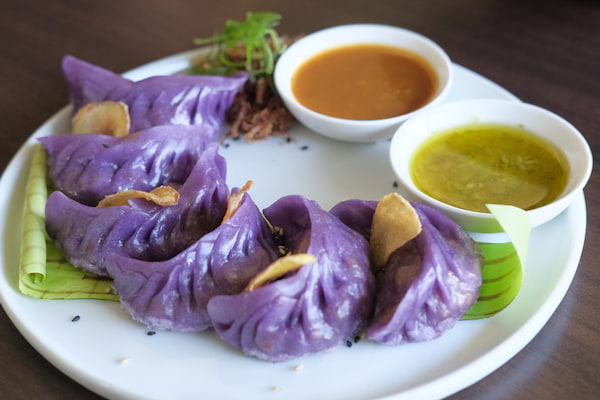 For starters, make sure to try their Homemade Pot Stickers (P310), purple yam dumplings filled with shrimp, minced pork shoulder, pork back fat, and Asian seasonings, topped with ginger chips. It's also served with a green scallion dip and sweet chili, to add more spice and flavor to it. 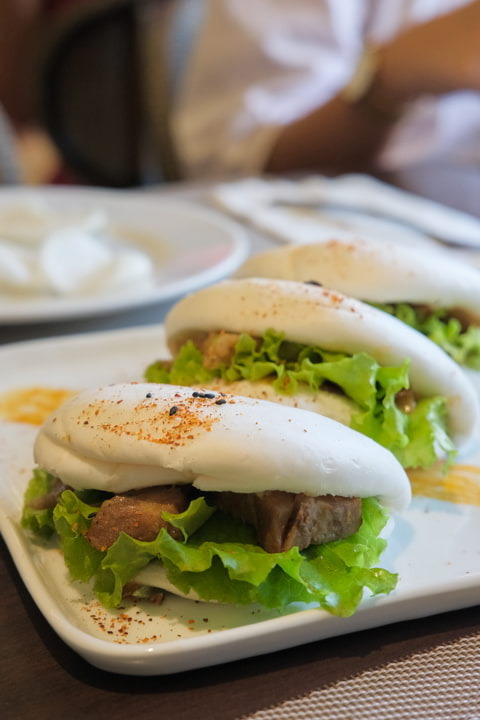 Then there's the Plum Style Cua Pao (P260) which has freshly-steamed Cua Pao buns stuffed with greens and pickled vegetables and a choice of either pork or chicken. 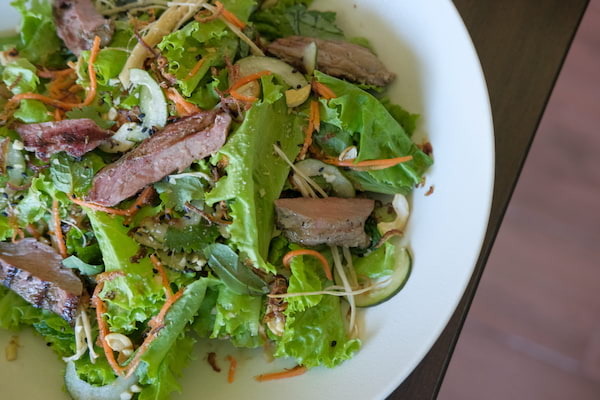 If you're one of those who are trying to watch their diets, Plum offers the Thai Beef Salad (P360) that has greens, enoki mushrooms, baby tomatoes, cashews, carrots, cucumber, and fried shallots. To make it even better, they also top the salad with grilled beef tenderloin, cooked to medium perfection. Also available in Plum is the Seafood Tom Yum Goong (P320), which is their "lighter" version of the Thai-favorite. 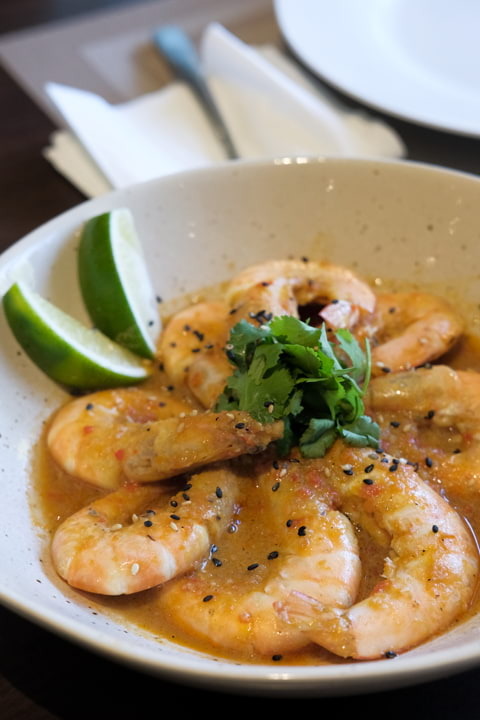 A serving of their Tom Yum gets you a generous amount of prawns, shallots, mushrooms, and tomatoes which are already good to satisfy 2 to three people. 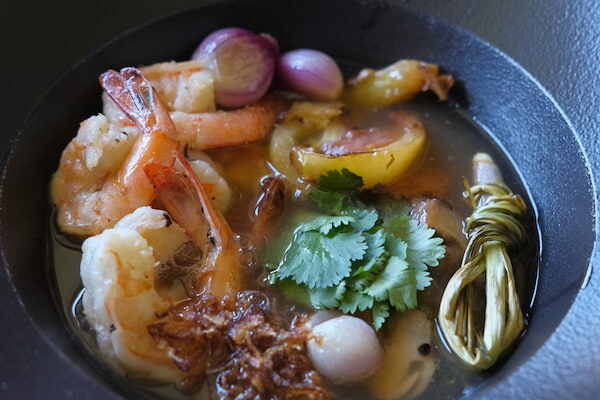 Its broth is also the delicious kind of sour, made from tamarind, lime leaves, and Asian aromatics. What's a meal in Batangas without bulalo, right? Plum also has its own version of the classic soup dish. 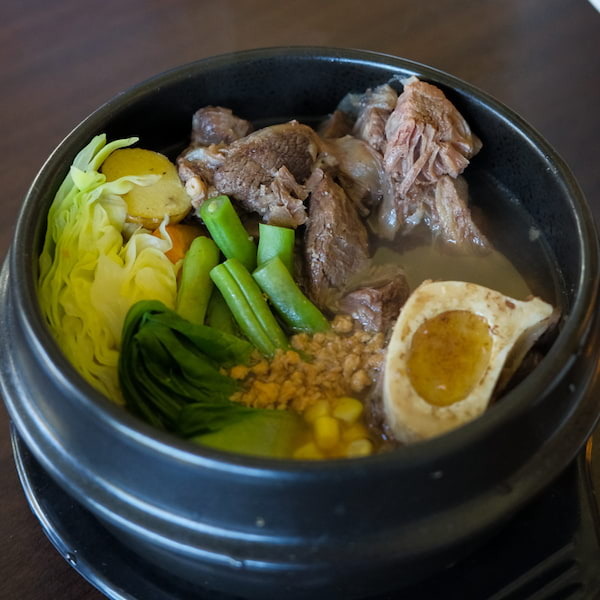 This hearty dish has tender beef shanks, bone marrow, bok choi, cabbage, carrots, potatoes, and green beans, making it a balanced meal that anyone would want to go back to every time they're in town. Plum took our favorite Filipino and Korean noodle dish and fused it in one. 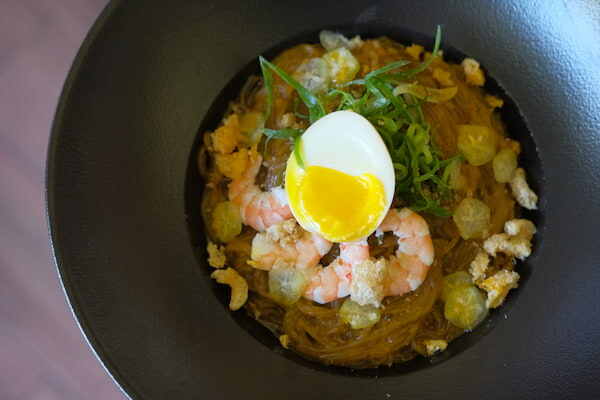 Their Pancit Palabok Japchae (P390) is basically japchae noodles with Dashi-infused shrimp and aligue sauce, and topped with the usual palabok toppings like shrimp, tinapa flakes, chicharon, leeks, and freshly-sliced kamias fruit. 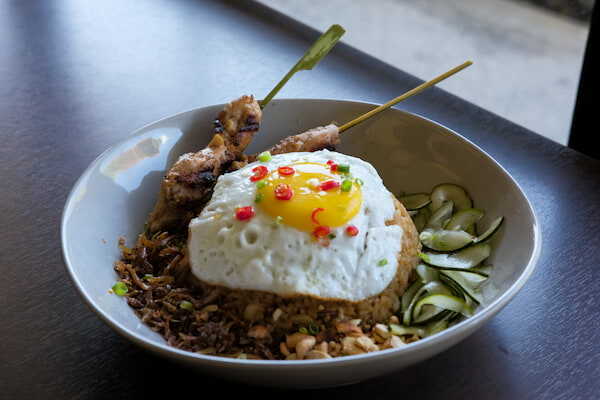 For the typical Asians who just can't live without rice, there's the Malaysian and Indonesian Nasi Goreng (P330). It's rice cooked in an Indonesian sweet soy sauce called Kecap Manis with shrimp and aromatics. The dish is also served with chicken satay and topped with egg, crispy dulong, cashews, pickles, and crispy onions to add to its flavor. If you want a rice dish that's more familiar in flavor, Plum also serves Thai Bagoong Rice (P280) which has bagoong paste, crispy pork bits, omelet, fried shallots, and topped with green mango. 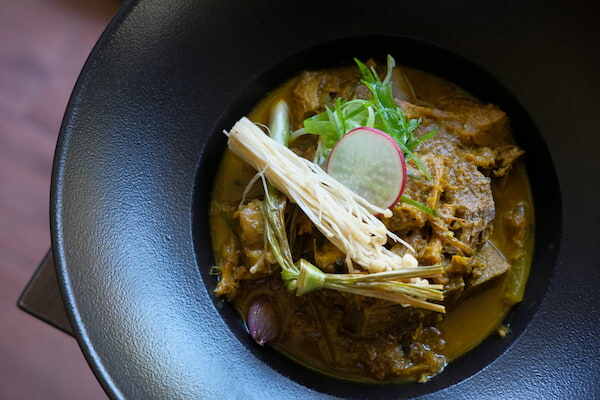 For a more spicey dish, you should not miss out on their Beef Rendang, which is a Southeast Asian dish with tender beef and oxtail, and cooked in coconut milk and a mix of different spices. Pair it with a steaming cup of rice, and you're definitely going to have a filling meal! Their Singaporean Chili Shrimps (P620), on the other hand, is cooked in chili, roasted peppers, and tomatoes, oyster sauce, and prawn headstock. A native dish in Batangas, Chicken Adobo Sa Dilaw (P390) is a must-try when in Plum. 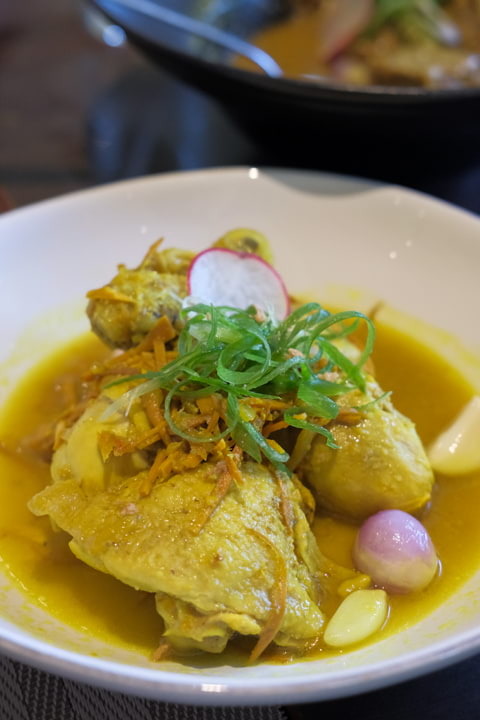 Instead of the usual adobo with vinegar and soy sauce, the Batangueño version is made by slow-cooking the chicken and cooking it in turmeric, aromatics, and vinegar. 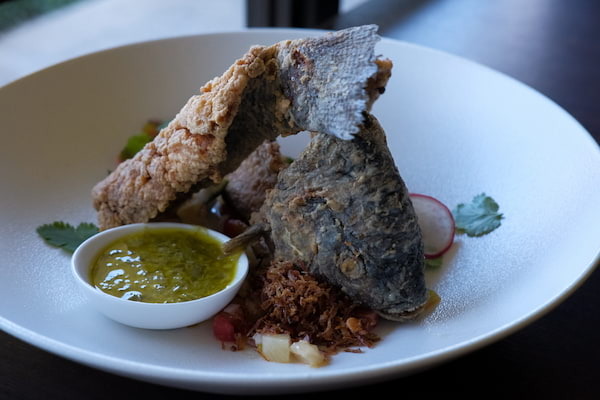 Made with the freshest fish, butterflied by the restaurant's butcher, Plum's Butterflied Fish with Pineapple Coriander Salsa (P520) is fried until it's perfectly crispy outside and tender on the inside. It's also served on a bed of coriander pineapple salsa, and with scallion ginger vinegar as a dip. 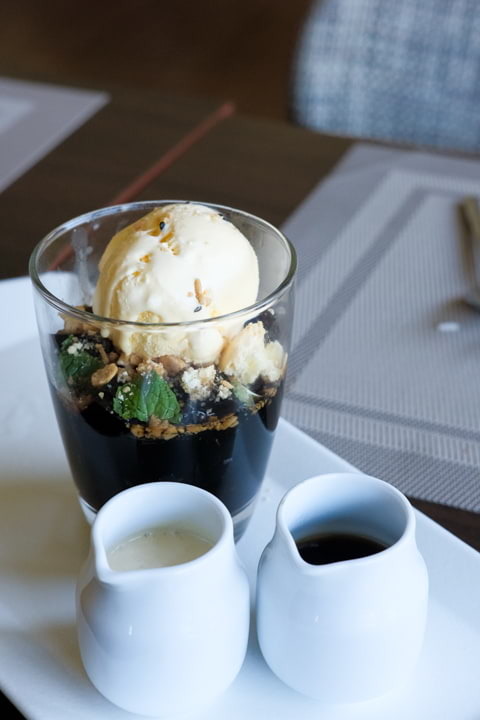 For dessert, Plum has Barako Coffee Jelly with Mantecado Ice Cream (P220), which is perfect for anyone who loves coffee. Aside from the coffee jelly and the ice cream in every serving, it also has some crumbled broas and paborita crackers to add a bit of crunch in every spoonful of it. 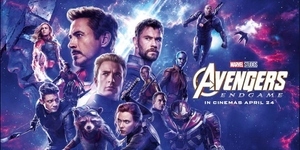 The Turon Con Latik (P130) has langka and plantain wrapped in a spring roll wrapper, drizzled with coconut caramel, and served with a scoop of ube ice cream. 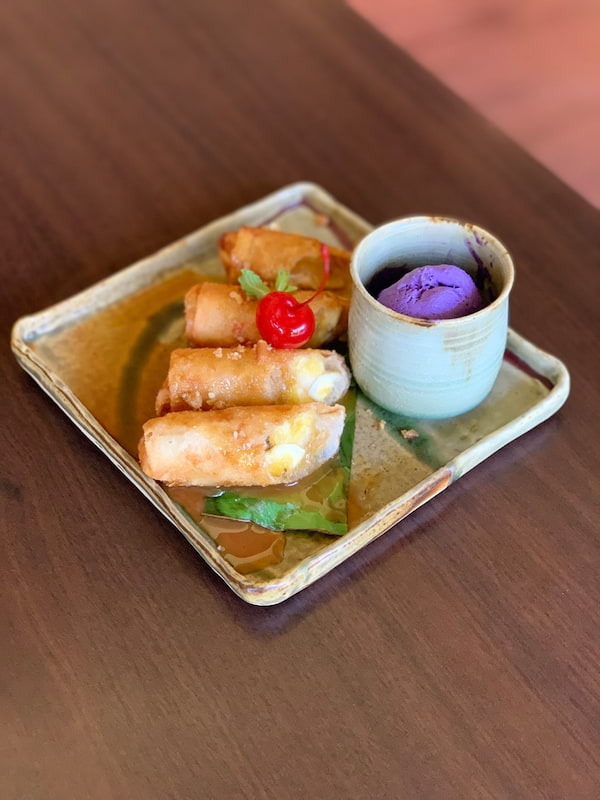 While it's already delicious enough to eat the two dishes on its own, it's also best to top your turon with a bit of ice cream for a good mix the hot and cold, as well as the flavors of the fruits and ube. 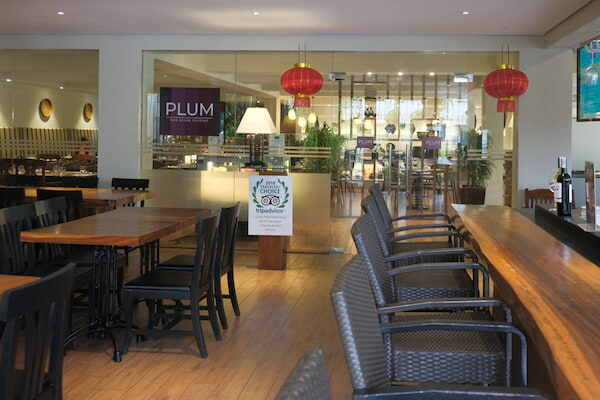 PLUM Asian Cuisine is at Lima Park Hotel, Lima Technology Center, Malvar, Batangas. 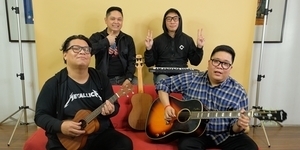 For more information, you may check out their official Facebook page.